Straight Talk: Off Duty Online Harassment may cost your JOB! We’ve all heard of cyber-bullying and online harassment through social media. 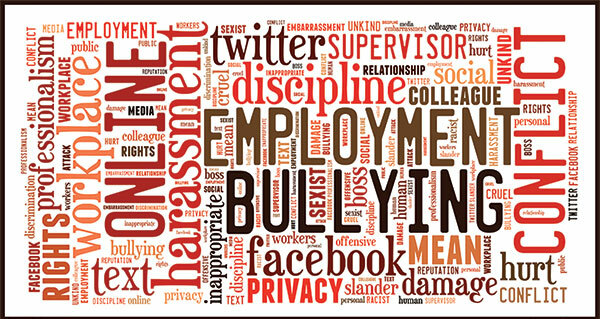 Did you know that if you engage in harassing behaviour online, you can be disciplined at work? The rules of your employment don’t end when you go home for the day. With the rise of social media, especially Facebook and Twitter, what we say online can really affect our working lives. It doesn’t matter if you’re posting from your home computer long after your work day ends; if your online behaviour can be linked to your workplace, your employer may have a legal obligation to make sure you are not harassing your co-workers. The law says employers have a responsibility to ensure a safe and harassment-free workplace. That includes ensuring protection from after-hours cyber-bullying. 1. Is what you are saying online harassing? Is it critical, mean or overtly personal? The first thing an employer would have to consider is whether what you said was actually a problem. ~Were your comments about a specific person or could they be reasonably interpreted to be about a specific person? ~Were your comments offensive or bullying in nature (the argument that you were making a joke won’t fly here)? ~Were they discriminatory (were they about a protected ground in the Yukon Human Rights Act)? ~Were your comments objectively inappropriate? 2. Were your comments made in a public forum? We tend to think of some arenas as private: your kitchen, your car, your Facebook wall….?! Although there are different levels of privacy on social media, Facebook & Twitter are NOT private. Even if you post in a private message, your comments could be shared using screen capture or other tools. If you have made offensive comments that you intended to be seen by a private audience (through a private message on Facebook, or to a select few followers on Twitter), you could argue that your comments were not made in a public forum. Proving that your comments were not public would help any argument you would make if your employer disciplines you for online comments. The reality is that once you put something out on the web you lose control of it. 3. Were your comments reasonably connected to work? If your comments were about a specific person in your workplace, whether you named them or just made it clear who you were talking about, your employer (and co-workers and friends and community members) could reasonably conclude that your comments were connected to the workplace, and therefore have an obligation to act. If you identify yourself on social media as working in that specific workplace, then your employer may also conclude that any comments you make are related to work and reflect poorly on the employer. Therefore, they may act to discipline you. If the answer to any of these questions is YES, your employer may have a legal obligation to discipline you. It is a complicated issue and there is not enough room here to go into the complexities. In the end, the best thing to remember is DON’T BE MEAN ONLINE! Not only does it hurt other people, but it could come back to hurt you at work too!